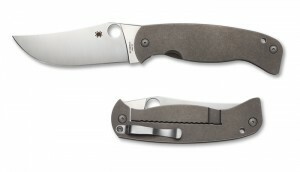 Description: Designed by British knifemaker Farid Mehr in collaboration with Spyderco, this Huge folder is classic Farid styling. Features a Titanium RIL Framelock and Farid’s Serpentine lock bar cut. This entry was posted on Tuesday, September 30th, 2014 at 10:33 am	and is filed under 4" or Larger Knives, Designer - Farid Mehr, Features - Screw Construction, Handles - Titanium, Lock - Reeve Integral Lock R.I.L., Manufactured - Taiwan, Steel - CPM 10V, Type - Folding Knife, Type - Utility Knives. You can follow any responses to this entry through the RSS 2.0 feed. You can leave a response, or trackback from your own site.